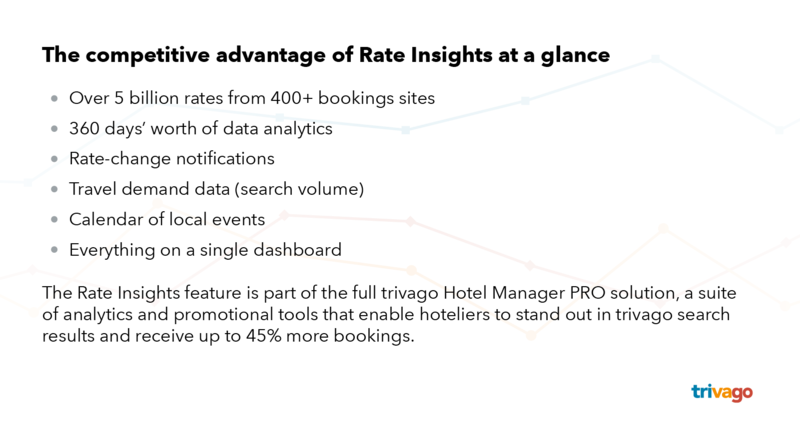 The Rate Insights feature, part of the complete metasearch marketing solution trivago Hotel Manager PRO, was inspired by a mission to empower hoteliers to be competitive online and a conviction that data-driven decisions are crucial to future success. In other words, the same price comparison data that’s making the metasearch site so popular among travellers is also available to those on the business side of the industry, to give hoteliers the same advantage: a transparent overview of the market, with access to hotel rates from across hundreds of booking channels and a way to quickly compare them on a single dashboard. It’s a competitive advantage that enables hoteliers to establish the smartest pricing strategies possible, as quickly as possible, as effortlessly as possible. Hoteliers with Rate Insights have an unparalleled vantage point from which to monitor both the properties they compete with and the OTAs they rely on for a healthy distribution mix. It’s a vantage point with 360 days’ worth of data analytics. With access to data on rates from up to 180 days in the past and in the future, hoteliers can identify pricing trends and set competitive prices up to six months in advance. And because they receive a notification when a competitor or OTA partner changes a rate, hoteliers see when there’s a need to lower their prices or an opportunity to raise them to reap more revenue. The takeaway: Hoteliers stay competitive online, knowing when and by how much to adjust their direct rates and all those listed with OTA partners. No pricing strategy is complete if it neglects factors that significantly impact the market. 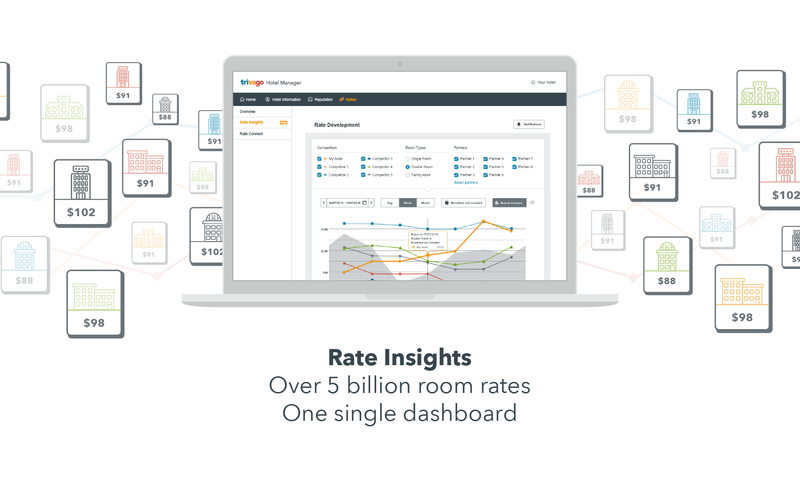 Which is why the new Rate Insights feature also grants hoteliers access to trivago’s significant data on traveler search volume and includes a calendar of events. With this data, hoteliers can take immediate action in response to fluctuations in demand and anticipate what upcoming events may bring about profitable spikes in tourism. The takeaway: Hoteliers boost RevPAR by staying agile with their rates and reacting quickly to changes in market demand. Unlike competitor products, Rate Insights is not limited to the hotel prices advertised on any single channel. It doesn’t need to predict what rates are shown on booking sites. It has data. Cold, hard, competitive-pricing-strategy-empowering data. Real rates aggregated from hundreds of booking sites; numbers of real travelers searching for hotels. Hoteliers now have this data as well, displayed on a single dashboard that’s easy to navigate and illustrated in clear analytics that provide sharp insights. Because all the data in the world is worth nothing if it’s not accessible. For trivago, this means that it’s not just available to hoteliers, but that it’s easy for them to understand and to harness for impactful decision making. The takeaway: Hoteliers overcome the time-consuming challenge of monitoring and analyzing the market, their competitors’ prices, and their own. There’s no humanly possible way for a hotelier to manually keep track of all their own rates (not to mention their competitors’) and always know when and by how much to adjust them. Only technology can aggregate so many rates and empower hoteliers to use this data to their greatest advantage in establishing competitive pricing strategies. trivago developed Rate Insights to this very end. To read up the importance of utilizing data to power decision making, here’s an article on that very topic.